This week, I celebrate my 5-year anniversary with diabetes. July 23, 2008. That’s 1,826 days–and considering I check my blood sugar at least 4 times a day, if I use 4 as the minimum amount, I’ve at least poked my finger 7,304 times now. That’s a lot of stinkin’ times. I don’t really know how to celebrate a milestone like this (certainly not with cake…haha! ), but I’ve never written out my story and now seemed like a good time. I was diagnosed with Type I diabetes at the age of 20 after losing about 20 pounds in just a couple of months. For whatever reason, my pancreas decided to stop producing insulin. I first noticed that something was different when I went to try on Easter dresses and had dropped a couple of dress sizes, especially considering nothing in my diet or exercise routine (ha!) had changed…and it wasn’t even marching season. So I did what any girl who was losing weight without trying would do: I ate everything in sight. Large sweet tea? Yes, please. Dessert? Every time. Ice cream before bed? Four scoops, please. Why yes, I’d love a large glass of grape juice and another grande java chip frappuccino. My favorite was our trip to Charleston with my grandparents that year. I was soooo soooo thirsty all the time. I would drink and drink and drink (sugary drinks of course…because I’m losing weight, remember?). And then I would pee and pee and pee. I just know my family loved traveling with me. Stop for a drink. Drive a little. Stop to pee. Thirsty again. Drink drink drink. Drive a little more. Stop again. It was fabulous. And then there was the night before I went to the doctor that I was supposed to fast after midnight and I stayed up eating CheezIts until 11:59. Another funny memory from the whole diagnosis process was coming home from my initial doctor’s visit and Aunt Janna asking, “What’d he say?” I replied, “Oh, it’s a girl.” Her eyes got soooo big. hahahaha! I had simply meant that my doctor was female. That day was so interesting. For the most part, I was fine. I was having some little girls over to paint picture frames for a surprise for their parents and I was making them lunch. So right after I got the call, I drove to Fresh Market to get some hot dogs and other items I needed for our lunch. The whole way there, I just randomly cried, but then I’d be fine. It was so strange. That night, I had to teach my kids class at church and the lesson was on “We Can Worship God No Matter What.” (Talk about incredible timing!) I was fine unless someone started hugging me or said something incredibly kind to me. During prayer requests, I distinctly remember my dad saying, “Just nobody hug her…or else she’ll cry.” Hahaha! Before all this came about, I had agreed to be on staff for band camp at my old high school, which started the Monday after my diagnosis. I’m so glad I kept this commitment because I think it was the first big step to proving I could still do anything in spite of this disease. This meant 12-hour days in the heat, but they were some of the best days of my life and led to years’-worth of good memories in this position. Sandwiched in the weekend between these two weeks of band camp were the weddings of two good friends…my first of many weddings without cake. Then a couple of weeks later, I started my own “grueling” band camp at UK. In just a matter of weeks, I was doing stuff I never dreamed I’d be doing. I was shooting myself in the stomach in restaurants, public restrooms, and anywhere I could be somewhat discreet. (Let me just take this moment to say that poking a needle into your own skin is something you never get used to no matter how much you try to psyche yourself up for it.) I had learned how to stuff needles, insulin, glucose tablets, a meter, and lancing device all up in a shako. I had learned how to count carbs and was keeping a detailed log of what I ate, when, what my sugar was, and what kinds of activities I was doing. It was intense. One of my craziest memories from the first few months was when the UK Marching Band played for the Ryder Cup in Louisville in September of 2008. 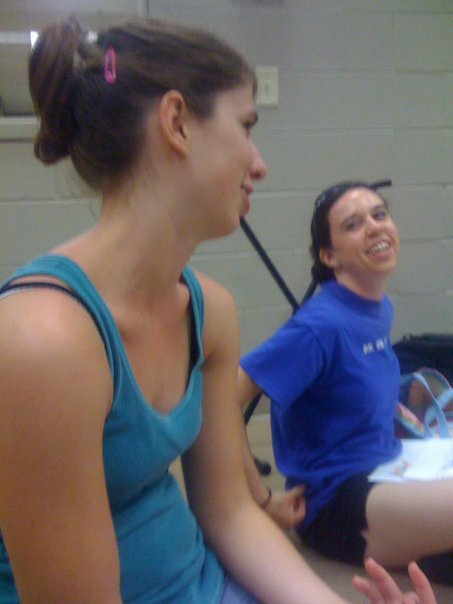 We had a really long rehearsal in Louisville one evening and I was still getting used to managing everything. We’d already had a really messed up eating schedule, so that had already thrown me off a little bit. 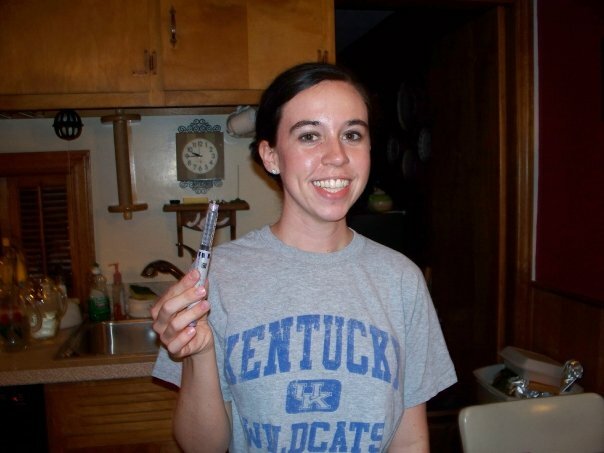 But the best part was this: I used to give my long-acting insulin shot (Lantus) at 11:00 every night. Well, at 11:00 that night, we were on the bus on the way home. So what did I do? Stuck the needle in my belly flab and gave my shot…in the dark…on an incredibly bumpy bus with little consolation from the person next to me. haha! Good times. You do whatcha gotta do. It’s still fun trying to manage roller-coaster blood sugars while you try to go about your everyday life. There was another time I was on a bus ride home from a really long band competition day and my sugar dropped to the low 60’s. I’m usually pretty good about keeping juice and food on hand, but for some reason, I didn’t have a Mott’s for Tots with me that night. I had stuffed an apple in my bag from the hospitality room earlier in the day–the pure providence of God. The staff around me was engrossed in planning the next year’s show as I tried to tell them my sugar was low. The guy next to me kept saying, “What’s that smell?” every time I would pull out something new to eat. I smell peanut butter. Is that an apple? I resorted to texting a student in the back of the bus so someone, ANYONE, would know why I died if the apple and nabs didn’t suffice. (I lived…in case you were wondering.) We joked that if the apple didn’t work, the staff would have to change their show plans for the next year to a Sarah Caroline Memorial Show and play Sweet Caroline. But He said to me, “My grace is sufficient for you, for My power is made perfect in weakness.”Therefore I will boast all the more gladly of my weaknesses, so that the power of Christ may rest upon me. “I hate needles.” Well friend, I don’t particularly like them, but God has graciously seen fit to sustain my earthly life by using them. “My grandma has diabetes.” *facepalm* Your grandma’s body most likely still makes insulin, but it has just decided not to respond to it anymore. That’s called Type 2 diabetes. I have the little kid kind. 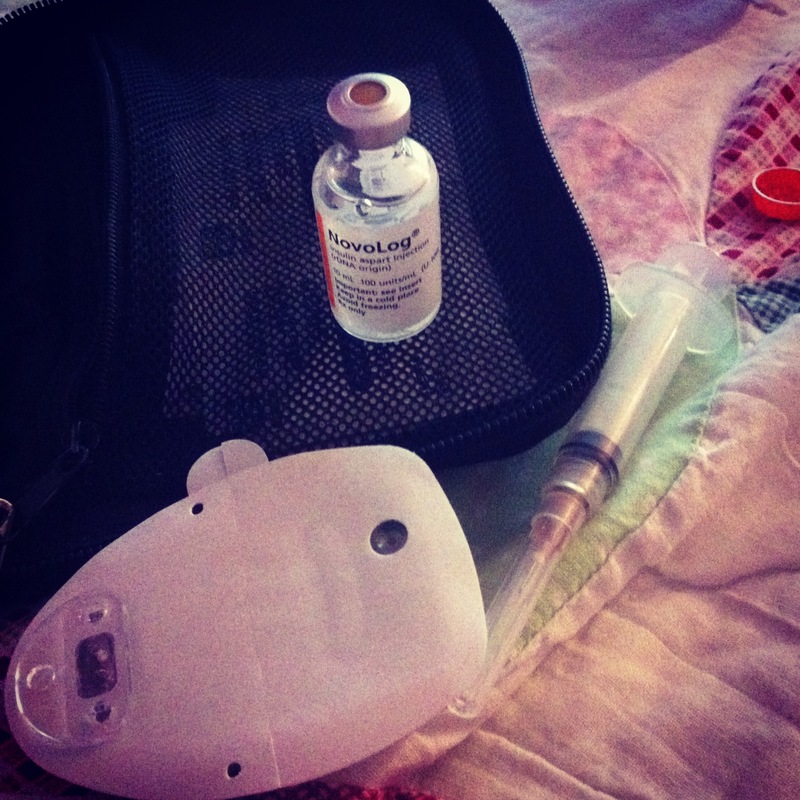 My body doesn’t make insulin anymore, but it still responds to it. That’s called Type 1. 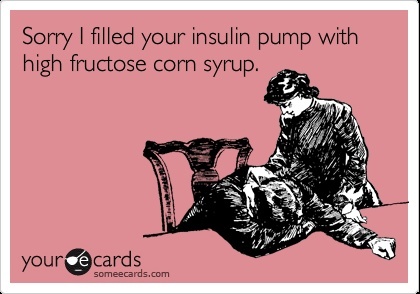 My diabetes is probably not your grandma’s diabetes, but thanks for the sympathy? “I bought you this cookbook.” This will either turn out to be really really good…or really really bad. “Did you know you don’t have to prick your fingers anymore?” I really do love it when people say this. I say it myself and laugh out loud at the commercial. But I do still prick my fingers because the thought of sticking my arm kind of weirds me out. If you’ve hung in here this long, bless you. Be sure to stay tuned for a list of my Five-Star Diabetes-related things, such as my favorite things to order at Starbucks and the best kind of alcohol swabs. I know I just pricked your interest. The “sugar blood” isn’t usually something I bring up as a conversation topic, but I’m most certainly open to talking about it with anyone who is curious. Just ask! Sarah, I don’t have *your* diabetes, I have the grandma version (*smiles*), and while I was just diagnosed, I could still somehow relate, just a little bit, to what you wrote. Perhaps it’s your humour and grace, or maybe it’s your faith, but this was exactly the sort of thing I needed to read right now. Bless your heart for sharing it with all of us. May you find the rest of your days be showered with good health and may your road always be, at the very least, dimly lit and not quite so bumpy. Thank you so much for dropping by and for your kind words. I can totally relate to a Type-2er in many ways…just accepting the news that you’re diabetic and trying to figure out what to do with that information is so incredibly overwhelming. 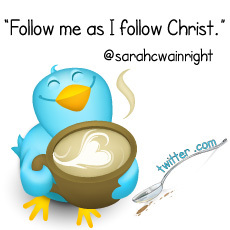 I will most certainly be praying for you as you add “the sugar blood” to your daily routine.